When one becomes a teacher, there is an often told piece of advice given from veteran educators that encourages a new teacher to “not smile before Christmas.” The idea is that, if you show your students that you are happy and having fun, you are indirectly showing them that you are “weak.” I thought long and hard about what I was going to be like as a teacher, especially since I was very young and had little experience. Sure, I student taught during college and worked in Harlem the summer leading up to my first year, but this was different. For the first time, I was on my own. And there I was, in September, standing by myself in front of a class of freshman ready to learn. I was a recent college graduate, I just moved to Newark a few weeks prior, and, at 21 years old, was the youngest member of the faculty by over a year. As an extremely young, new and inexperienced teacher, it was initially a challenge to gain the respect of the students and ever other teachers, some who had lived in Newark their entire lives. It was an interesting dynamic, but once people started to see who I really was and what my intentions were, things started to fall into place. My first semester had its ups and downs, and my teaching career had officially begun. In addition to teaching, I was very fortunate for all of the amazing opportunities I had as a first year teacher. Perhaps most notably, I was able to chaperone three overnight trips with the Student Council, including college visits to Washington, D.C. and Boston and a trip to the 2013 Presidential Inauguration. As a result, I really got close with some of the Student Council members, mostly upperclassmen whom I otherwise would not have had a chance to work with and get to know individually. These students gave me tremendous insight into their lives and what it is really like growing up in Newark. When I reflect back on my first year of teaching, it is the stories and conversations that stand out to me that are the most memorable. I have been so lucky to have had such amazing conversations with so many students this year, with discussions ranging everywhere from college life to immigration reform to living in poverty. I really enjoy having lunch with students and getting to know them on a more personal level. I often say that I feel that I learn more from them than I could ever teach them in a million years; I sure do hope that the ‘learning’ is mutual. I could go on and on about so many conversations I have had, like one about college with a rising junior till 5:00pm on a random Friday or standing on the national mall in DC listening to undocumented students from Brazil explain their struggles with things we all take for granted every day, like applying to college or even working a summer job. As I have stated previously, it is one thing reading about deep social issues such as the achievement gap or institutionalized racism, but experiencing it first hand is surreal. With the 2013 NPS Math Olympics Pre-Calulus Champions! Loved working with this team and these students so much. I wish I could articulate every lesson I learned from my first year of teaching, but I would probably need to publish a book to do so. This has undoubtedly been the biggest life changing and eye-opening year of my life; my perspective of urban areas and social classes has changed tenfold. I wish everyone at some point in their lives has the chance to work at or visit an inner-city high school, as I think it offers great perspective into different people’s lives. It is an absolute privilege (and a unique challenge) to work with teenage students, and I promise you I never have a boring day at work! Sure, there were many times that I put in 12 hour days or stayed late to watch a game or advise a public speaking club, but it is these moments that really make it all “worth it.” I can honestly say that I love coming to work every single day. especially since it was the students that selected it. Well, year one of teaching is in the books, folks. Almost exactly a year ago today I was heading into Newark for the first time, really unsure of what to expect from a city and school district I have heard so many negative things about. Looking back, moving to and working in Newark was perhaps the best thing that has ever happened to me. I love where I work, the students I work with, and many of my colleagues with like-minded attitudes that really care about our students. I have learned a lot from year one (including the fact that, against popular opinion, it is extremely important to smile before Christmas), and I am already thinking about what can be done better next year. I could not have asked for a better first year of teaching. Now let’s see what’s in store for year number two. How about a simple solution? This post is exactly that. Let’s start with an even simpler question: What science classes did you take in high school, and in what order? If you are with the overwhelming majority of people who graduated high school in the last few decades, you undoubtedly took Biology first, then Chemistry, followed by Physics, if you chose to take it. Most high schools in America, whether an elite private school in Westchester or a public SIG school in Chicago, offer these three science classes in that order. Perhaps the better question is, why do schools sequence science classes in the way that they do? Most people, myself included, would probably give a reason involving math, putting forward an argument that Algebra I is required for Chemistry and Geometry is required for Physics. Since most students only take Algebra I freshman year and Geometry during their sophomore year, they would not be qualified to comprehend the higher levels of science without the strong backing in math. Another often-held thought is that Biology is an easier course than Chemistry or Physics, so students will be more likely to pass that class during freshman year. These sounds like reasonable arguments, no? Here’s the kicker: It turns out that, the real reason why high schools sequence their classes as Biology-Chemistry-Physics has nothing to do with math, student achievement levels, or even teacher certifications. Originally, some school administrator somewhere ordered these classes like so because they were in alphabetical order (B-C-P). Yes. I know it is hard to believe. If you doubt that claim as I did, look up some historical information, and you will be just as surprised as I was. But what’s the “so what?” factor here? This past weekend, I had the pleasure of meeting Dr. Michael Kuchar, Superintendent of Bergenfield Public Schools in New Jersey. Explaining the background of a Physics First curriculum, he flopped the order of the science classes in his district, so that all students, including honors and classified special education students, took Physics before Chemistry and then finished with Biology. How did Bergenfield High School do, you ask? In one year, proficiency rates on the Algebra I EOC test skyrocketed from a 36% passing rate to an 80% passing rate. That is an increase of 46% in one academic year! My question: If such an easy fix can drastically improve student achievement in one year, what are other basic changes that we could make that could help transform our school system? Education Reform is often heralded as this massive beast that involves complex ideas and ideologies to completely overhaul the system. Switching Physics and Biology seems easy enough to me. Now, how about another simple solution? Author Andrew PaulsenPosted on June 1, 2013 Categories Ed Reform, Education, First, leadership, PhysicsLeave a comment on How about a simple solution? My First Marking Period is in the Books! After spending years in different classrooms observing, student teaching, tutoring and volunteering, I was both very anxious and excited to actually have a class of my own this year. Last week signaled the end of the first marking period; what an interesting first quarter it has been. A week before school started, I finally received the keys to my classroom. When I walked in for the first time, the room was nothing like I had envisioned at all. 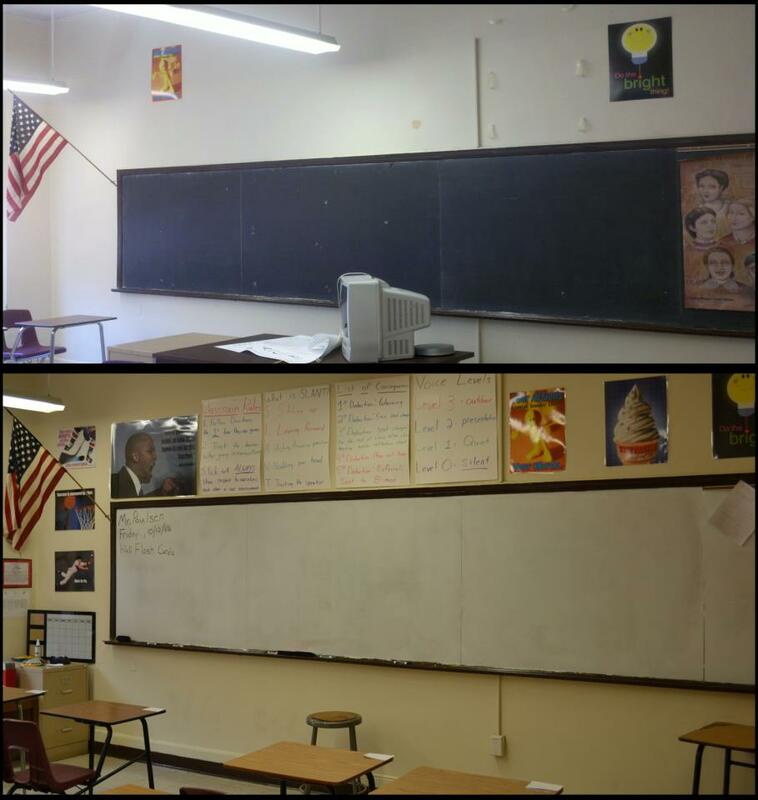 I had six desks in my class, there was graffiti on all of the walls, everything was dirty, and to say I was disappointed would be an understatement. But it the midst of all the ruble, I saw the layout of a great classroom. I knew I only had a few days before school started, so I got to work right away trying to make the best classroom with the materials I had. I started by throwing away all of the broken furniture, ripped posters and frog dissection kits (you read that correctly) that were clogging up the room, and began wiping down everything covered in dirt and dust. I re-did the bulletin boards (which came out very well thanks to my experience from my RA days), found some new inspirational posters to hang up, and strategically hung them to cover gaping holes in the walls. Another aspect of my classroom that was rather disconcerting was the presence of a blackboard in my room. I never liked teaching with chalk, as my clothes always got very dusty and the chalk made me cough a lot as well. I decided that I needed to somehow turn the blackboard into a whiteboard, but I didn’t know how. I started by calling some companies that professionally installed white boards, but the cost was way too high (a couple of thousand dollars). As I was telling my co-workers about my idea of getting a white board, another TFA corps member told me about special white-board paint that I could buy that would easily turn my blackboard into a whiteboard. I went to the store and, for $50.00, I bought two cans of white-board paint, some paint brushes and other painting supplies. I asked some of my students to help me out, and we stayed around, ate pizza and painted for a few hours after school on a Friday. The board came out so great! Seeing my students want to stay late after school on a Friday to help me paint was one of the most memorable moments in my teaching career so far. After the whiteboard was done, I felt that our class would benefit from a projector so that I could show powerpoint presentations and clips from Youtube, helping make math class more fun and engaging. Once again, we had no money for a $600.00 projector, but I knew how beneficial it would be to my students. After talking to many people about possible fundraising ideas to raise money, I went on Donors Choose and asked for an LCD projector for my room. Nine donors funded the $684.48 project in less than 48 hours, and the projector was at East Side a few days later. With the projector in hand, the white board ready, and my room starting to actually feel like a classroom, I knew that I was going to be able to drastically improve the effectiveness of student learning in the coming weeks. People are often surprised when I tell them how much I am enjoying working in an inner-city high school in Newark, NJ. Is everyday a great day? No. Are there many frustrating moments and days when I go home with a splitting headache? Of course. But there are so many small victories day to day that makes it all “worth it.” Last week, for example, one of my students said to me: “Mr. Paulsen, you have a gift. We walk into your class and we are so excited because you are the only teacher we like.” Now who knows how true that may be, but it made my day regardless. Author Andrew PaulsenPosted on November 25, 2012 June 15, 2018 Categories East, Education, High, Math, Newark, NJ, School, Side, STEM, teach for america, TeachingLeave a comment on My First Marking Period is in the Books! 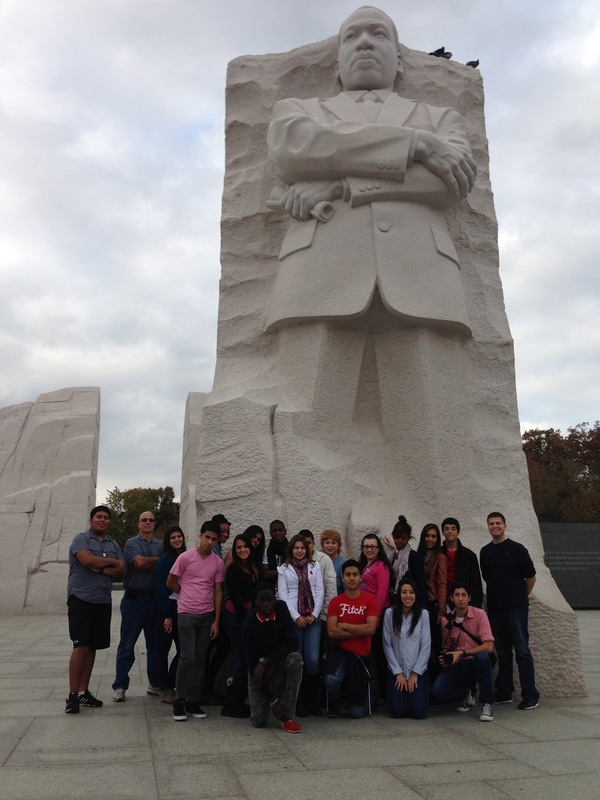 I just got back from Washington D.C. with the East Side High School Student Council. After being surrounded by 9th graders for the first seven weeks of school, it was very different being with the brightest 11th and 12th graders East Side has to offer. When I was first asked to chaperone the overnight trip to our nation’s capitol, I was so excited, as I really enjoy the D.C. area and I have been involved with student government for as long as I can remember. I expected to have a great time touring Georgetown and American University and all of the historical artifacts in D.C. What I did not expect, however, was just how powerful these two days were going to be. I first want to mention how appreciative the entire group was from when we first boarded the bus until we got home. From going to the 4D movie at the Newseum to the many rounds of candy given out on the bus, everything we did was greeted with a “thank you,” and the students were so grateful for everything. Three of the students had never been out of the Newark-NYC area in their lives, and a few had never stayed in a hotel. 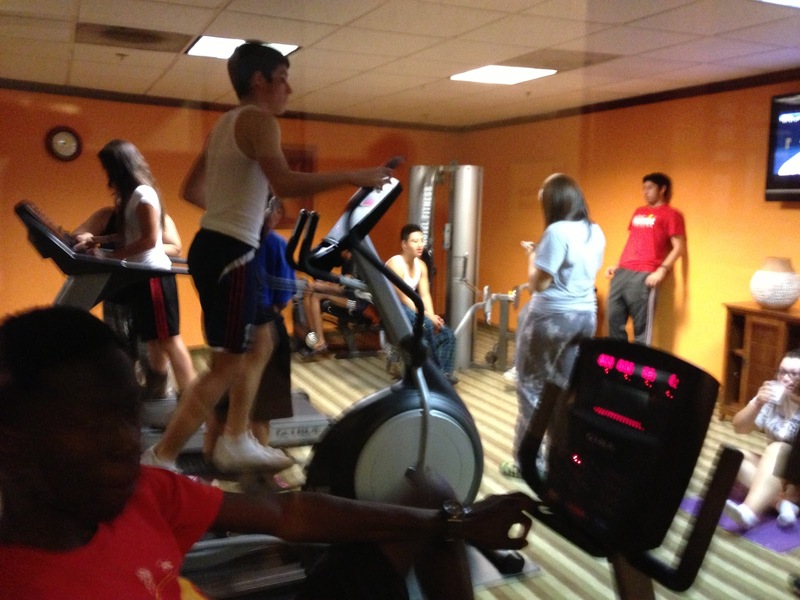 On Thursday night, I was walking around the hotel lobby, and saw that they were all working out in the hotel’s gym. Perplexed as to why they all wanted to work out on the one day they had off, I decided to go into the gym and ask them. They told me that they were so excited that the gym was free and that it was open 24 hours, and it was a great place to hang out. Our students were so happy to do things that others take for granted every single day, and it was humbling to say the least. On the flip side, what surprised me the most perhaps was how other people viewed and looked at these students at almost every place we visited. Seemingly unbeknown to a majority of the students, almost everywhere we went, people looked at these students as if they were out of place. On Friday morning at the hotel, for example, a table of other hotel guests literally got up and left breakfast early because our students were eating breakfast. 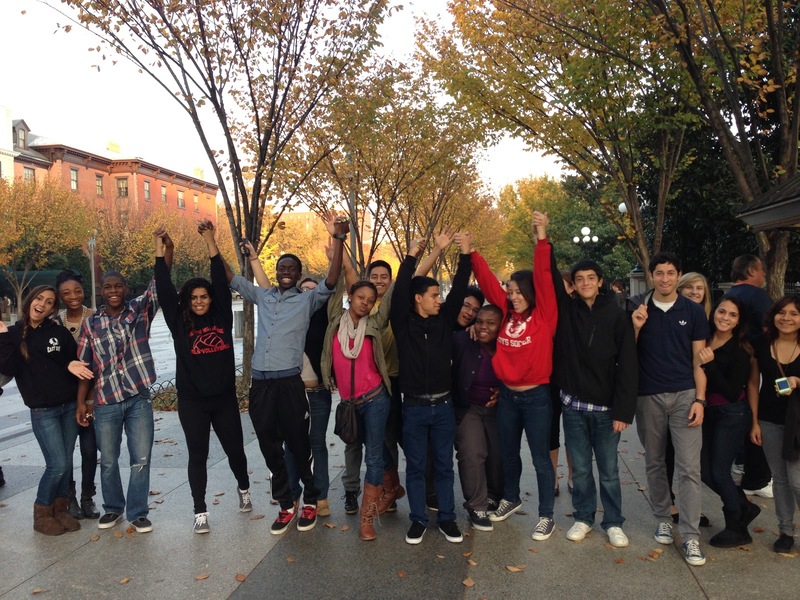 Many times, complete strangers would give glancing looks at these students, almost as if they wanted to ask why these students were in D.C. or visiting college campuses. The weird thing is that most of the students didn’t even seem to notice, and even the ones that did weren’t bothered by it, possibly because they are all used to living in a world with so many ignorant people. It was eye-opening to see this first-hand, and although we have made tremendous progress over the last 50 years, we still have a long way to go. at the Martin Luther King, Jr. The most powerful moments of the trip, hands-down, were when we were at the two colleges we visited: Georgetown and American University. It was so unbelievably inspiring seeing so many students from Newark interested in college. 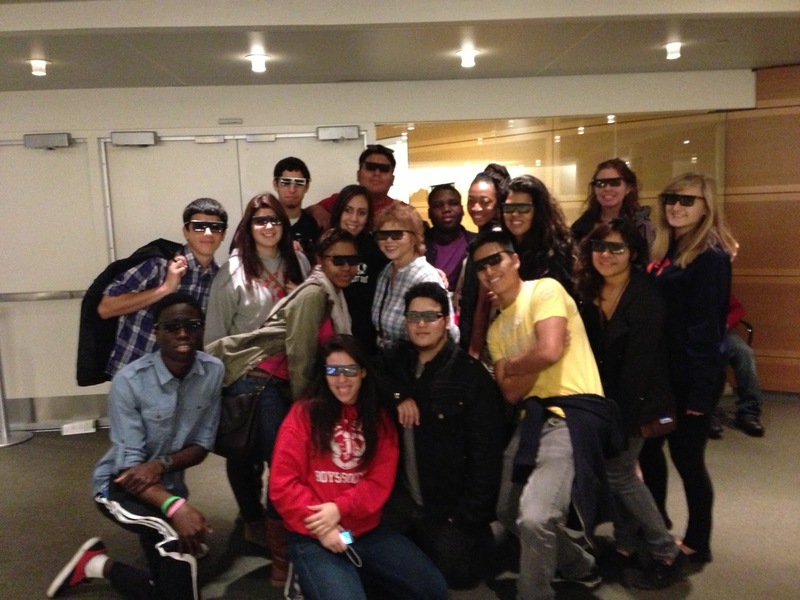 During the tours, they asked brilliant questions about college life, admissions procedures, and financial aid. It was interesting hearing them worry about things that I took so much for granted for when I was a senior in high school – like how to get into a school without a social security number or how to fill out a mandatory FAFSA form if their parents are undocumented. For many of these student leaders with high GPA’s, the admissions process and financial aid procedure itself is a hindrance to going to college. Although I have read about it many times, actually experiencing institutionalized classism first hand is one of the most opinion-changing events that I have ever stood witness too. The ESHS Student Council excited to be walking around D.C.! Throughout the trip, I was fortunate to have had many amazing conversations with these great students about their future and how they plan on getting there. One of the best conversations I had was with a bunch of seniors about the notion of going to a community college for two years to save money before transferring to a four-year university. Some of these students may have faced tremendous adversities and obstacles in their life, but it is not stopping them from expecting the best out of themselves and attempting to get the best education that they can. After spending two days with this bright, articulate and inspirational group of people, I have tremendous faith that these students are going to be successful in whatever field they want to after college and finally break the “vicious cycle” for their families. I have no doubt that the kids I got to know the last two days are going to be the next great leaders of our country.